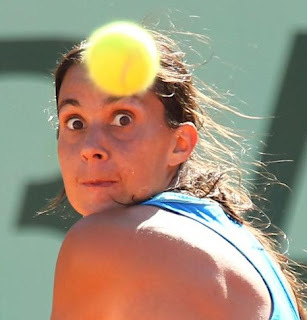 Body Language & Emotional Intelligence: Negotiation Secret # 131: When the eyes are "White and Wide"
When the eyes are "White and Wide"
This is French tennis player Marion Bartoli at the recent French Open. Notice the "Whites" of her eyes (sclera) are visible on the upper portions of each eye. During most "normal" activity, about 2 to 3 millimeters of the tops of the iris/cornea are covered by the upper eyelids - from about 10 o'clock to 2 o'clock. During activities of some extreme emotions, such as surprise and fear, the eyes display this "White and Wide" appearance. These emotional states are both accompanied by adrenaline rushes. Ms. Bartoli's adrenaline is elevated for another reason though - extreme athletic exertion. What are some other examples of this scleral show that we see every day - and should they be raising red flags?